Most of us have dozens of online accounts: social networks, news services, cloud storage services, and more. What we like on BuzzFeed can quite easily be posted to Facebook, of course, but what if we post something to Facebook and want to save it to Dropbox? That's where the increasingly powerful If This Then That (IFTTT) service comes in. IFTTT is something of a meta-app, connecting the apps and gadgets you use via mini-programs (called “recipes”). Currently, IFTTT works with over 160 web services and gadgets. You can automatically back up all your Instagram pictures to an online storage folder, for example, or leverage your location to record when you arrive at the office. You can get email alerts for items you're looking for on eBay and Etsy, or from Boxoh Package when the shipping status for a given package changes. IFTTT also connects to home gadgets such as the Nest thermostat, and fitness trackers such as the Misfit Flash, which can use sleep pattern data to turn on a Wi-Fi-enabled coffee-maker as you're waking up. The services that IFTTT works with are called “channels”, with each channel – such as Gmail, Facebook, or Digg – having its own set of “triggers” and “actions.” For example, triggers for Gmail include “new email” or “new starred email," while Dropbox actions include “download file” and “add to a text file.” So a recipe could go something like: if there's a new starred email in my inbox, save it to Dropbox. The interface for creating your own recipes is streamlined and easy to navigate, but if creating your own IFTTT recipes from scratch seems overwhelming, start by browsing the 100,000 or so published recipes from IFTTT users and developers. You can simply click on the ones you like to start using them. Think about what services you use the most. If you're always browsing and posting to Instagram, browse IFTTT.com for Instagram-tagged recipes. One recipe we like fixes a current hole in Twitter/Instagram cross-posting: if you're posting a picture directly from Instagram to Twitter, the picture appears as a link instead of an image. This helpful recipe embeds Instagram pics into a Twitter post instead. If you're signed in, you can simply hit “Add Recipe” to get the recipe working on your accounts. You'll have to give permission for IFTTT to access your Instagram and Twitter accounts, at which point these channels become “activated” and can be used for any other recipes. To find more recipes, you can also browse by collections of published recipes that show which have been liked and added the most. Here you can check out recipes for online shopping, photography, and more. 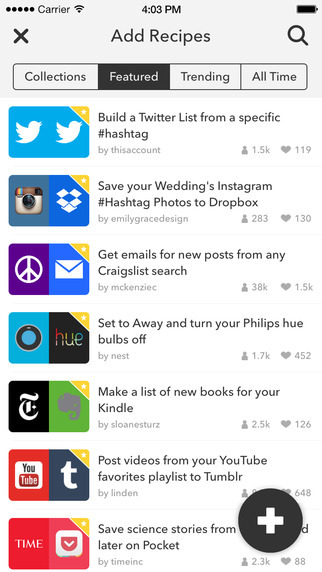 What you can do with IFTTT expands when you download its official app, IF (Android, iOS). You can start using commands based on your physical location (assuming you have your smartphone with you). For example, you can log the hours spent at work by adding a recipe that clocks when you arrive at and leave certain GPS locations, saving each day's times to a Google Drive spreadsheet. When adding recipes, be sure to customize them with your own details by heading into My Recipes (top of the screen) and clicking the pencil icon next to the recipe. You can then scroll down to update, in this case, the location of your own office and the name of the Google Drive spreadsheet to create. To find more useful recipes, think about which tasks you'd like to do faster and search for related keywords. For example, you could search for the keyword “work” or “office” to see which recipes deal with streamlining your paid labor time, from turning on your Philips Hue lightbulb when it's time to wake up, to activating your Android phone's Wi-Fi connection only as you approach the office. The IFTTT interface makes it pretty simple to cobble together your own recipe. Hit Create Recipe, and explore the channels for services you use frequently. Let's start with Instagram, for example. Selecting Instagram brings up a list of triggers you can select, say, “Any new photo by you” or “You like a photo.” Again, explore this list to figure out what could work for you. Select a trigger, then choose what to do with it by selecting again from the list of channels and browsing the actions allowed. For example, Dropbox or Google Drive channels include the action to save the picture, while Gmail and Email have actions including sending an email to up to five addresses, so that you could automatically send favorited Insta-pics to a family member who isn't on Instagram. Once you confirm the recipe, IFTTT will run it on your selected accounts. Recipes only work with new posts (or emails, or whatever your triggers are) – so in this case, all future Instagram posts will be saved or emailed, but old ones won't. The IFTTT team recently launched a trio of quick-fire apps based on IFTTT recipes: Do Button, Do Camera, and Do Note. The Do Button (iOS/Android) is an app that can save up to three recipes, with one “active” so that you simply tap the icon on your homescreen to run the recipe. The kicker? Instead of waiting for a trigger, like getting a new email, the tap triggers the action. So recipes can exist in a simpler form, such as “Email me a Google map of my current location,” which would be handy for quick forwarding if the person you're meeting is lost. Another interesting option is the running tally recipe, which allows you to tap the screen for whatever you're counting, whether it's attendees at a conference or the number of times your boss says the word “synergy.” The count can be automatically saved to an online document. Do Camera directs actions on the camera app, such as saving all pictures to a Google Drive folder. Real-life use? Keep this recipe active on Do Camera, then open the app and use it to take pictures of receipts, automatically saving them to an online folder for easy access come tax season. Finally, Do Note allows you to type directly into the app, then, depending on the recipe, save those brilliant ideas to an Evernote notebook, or that bill tally to a Google Drive spreadsheet. Just like the web-based IFTTT, you can browse thousands of pre-created recipes from inside these apps. If you're an early adopter of smart home and smart car technologies, the power of IFTTT is even more impressive. For instance, One recipe uses your Automatic car adaptor to let your Nest thermostat know when you've left work so the house is nice and toasty for your arrival. As more smart gadgets get online, IFTTT will allow greater power over the web services we use and the data we create every day. In the comments section, let us know which sorts of tasks you'd like to automate, and keep an eye out for a list of our must-try IFTTT recipes next week.